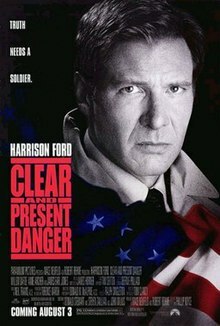 Clear and Present Danger is a 1994 American spy thriller film directed by Phillip Noyce and based on Tom Clancy's novel of the same name. It was preceded by the 1990 film The Hunt for Red October and the 1992 film Patriot Games, all three featuring Clancy's character Jack Ryan. It is the last film version of Clancy's novels to feature Harrison Ford as Ryan and James Earl Jones as Vice Admiral James Greer, as well as the final installment directed by Noyce. As in the novel, Ryan is appointed CIA Acting Deputy Director, and discovers he is being kept in the dark by colleagues who are conducting a covert war against a drug cartel in Colombia, apparently with the approval of the President. The film premiered in theaters in the United States on August 3, 1994, and was a major financial success, earning over $200 million at the box office. The discovery of the murder of an American businessman, Peter Hardin, and his family, outrages U.S. President Bennett, Hardin's personal friend. When Hardin is found to have been connected to a Colombian drug cartel, from which he skimmed over $650 million, Bennett tells James Cutter, his National Security Advisor, that the cartels represent a "clear and present danger" to the United States, tacitly instructing him to use force against the men responsible for his friend's murder. Jack Ryan, appointed acting Deputy Director of Intelligence after Vice Admiral Jim Greer is stricken with cancer, asks Congress for increased funding for ongoing CIA operations in Colombia, believing the funds to be for advisory purposes only. Keeping Ryan in the dark, Cutter turns to CIA Deputy Director of Operations Bob Ritter to take down the cartel. Ritter assembles a black operations team with the help of John Clark. The team inserts itself into Colombia, with Clark running logistics and Captain Ricardo Ramirez leading the squad on the ground in clandestine search-and-destroy missions against the drug cartel. Meanwhile, Bennett sends Ryan to Colombia to investigate Hardin's cartel connection. The cartel leader responsible for Hardin's murder, Ernesto Escobedo, is enraged when the U.S. attempts to claim the $650 million that was stolen from him, and has his intelligence officer, Félix Cortez, try to retrieve the funds. Bennett sends FBI Director Emil Jacobs to meet Ryan in Colombia and negotiate for the money, and when Cortez discovers this, he plans an ambush, engineering it so that suspicion will fall on Escobedo. Ryan barely escapes the ambush, but the rest of the entourage is killed. Escobedo then calls a meeting with other cartel leaders, which Clark's team hits with an airstrike, but Escobedo is late arriving and survives. Cortez discovers the American involvement in the strike, and meets with Cutter to broker a deal. Cortez will assassinate Escobedo and take over the cartel, promising to reduce drug shipments to the U.S. and allow American law enforcement to make regular arrests to make it appear as if the U.S. is winning the drug war. In exchange, Cutter will shut down all U.S. operations in Colombia and allow Cortez to hunt down Clark's soldiers. Cutter agrees and orders Ritter to get rid of all evidence of their operations and cut off the troops in Colombia from all support. Ryan is played a recording of the conversation between Cutter and Cortez. He hacks Ritter's computer and discovers the conspiracy unfolding in Colombia. The black-ops team is ambushed in Colombia by Cortez's men. Ryan arrives and convinces Clark to allow him to help. They find the team's sniper, Chavez, who tells them that Ramirez and a squadmate have been captured and the rest have been killed. Ryan visits Escobedo's mansion and shares his intelligence on Cortez. Enraged, Escobedo confronts Cortez, but is killed by Cortez's associate. Ryan, Clark, and Chávez rescue the prisoners, kill Cortez, and escape. Ryan confronts the President and tells him he intends to inform the Congressional Oversight Committee about the conspiracy despite the damage it could do to his career. As he walks out of the Oval Office, Cutter asks to speak with him, but Ryan ignores him. Ryan then begins his testimony to Congress. John Milius wrote the first draft and later added the sequence where Jack Ryan is ambushed in SUVs. He said that the original ending had Cortez going to Washington to kill the national security adviser, only to be killed in a mugging by drug addicts. The film's musical score was composed by James Horner. Milan Records released an album featuring selections from the score on August 2, 1994. An expanded two-disc collector's edition was released in 2013 by specialty label Intrada Records. The new version now includes the complete score by Horner, remixed from the original scoring master tapes with cues appearing in the same order as they appear in the film. Some parts of the soundtrack are based on the music from James Horner's soundtrack for Gorky Park, but played with different instruments. The film received positive reviews from critics. Rotten Tomatoes gives it a rating of 80% based on reviews from 40 critics. At Metacritic, which assigns a weighted average out of 100 to critics' reviews, Clear and Present Danger received a score of 74 based on 14 reviews. Audiences polled by CinemaScore gave the film an average grade of "A" on an A+ to F scale. Noyce, who also directed "Patriot Games," manages to keep the complex story lines from snarling even though he relies heavily on crosscutting. The technique, which he uses ingeniously here, enlivens scenes that are technologically driven and potentially deadly. Mick LaSalle, writing for the San Francisco Chronicle, commented how it "delights in an almost boyish way in the trappings of power: rocket launchers and high-tech missiles, flags, ceremony and political double-speak. "James Berardinelli, who wrote for ReelViews, remarked, "Clear and Present Danger is all plot and no characters. The people running around on screen have about as much depth as the sheen of sweat on Harrison Ford's forehead. Jack Ryan is the most disappointing of all. He's disgustingly virtuous: a flawless fighter for good and justice, a Superman without the cape. I spent half the movie wondering if this guy was ever going to show anything to mark him as vaguely human." In Reel Power: Hollywood Cinema and American Supremacy, author Matthew Alford formulated a critique of the film, pointing out that supporting characters like Cutter and Ritter are pointedly squeamish about the use of force. He queried, "Where is this abundance of sensitivity from the US national security apparatus towards the people of Latin America in the real world?". He concluded, "The answers are all too obvious, except to a Hollywood hooked on schmaltz, willfully ignorant of reality and in thrall to power." Clear and Present Danger opened strongly at the U.S. box office, grossing $20,348,017 in its first weekend and holding the top spot for two weeks. It went on to gross an estimated $122 million in the U.S., and $94 million in foreign revenue for a worldwide total of $216 million. The film was nominated for two Academy Awards for Best Sound (Donald O. Mitchell, Michael Herbick, Frank A. Montaño, and Art Rochester) and Best Sound Editing (John Leveque and Bruce Stambler). ^ "Clear and Present Danger (12)". British Board of Film Classification. August 15, 1994. Retrieved September 4, 2016. ^ a b c "Clear and Present Danger (1994)". Box Office Mojo. Retrieved September 18, 2018. ^ "Clear and Present Danger". Turner Classic Movies. Retrieved March 23, 2016. ^ "Clear and Present Danger - Audio CD". Amazon.com. Retrieved February 3, 2014. ^ "Clear and Present Danger". Rotten Tomatoes. Retrieved January 27, 2014. ^ "Clear and Present Danger". Metacritic. Retrieved January 27, 2014. ^ Kempley, Rita (August 3, 1994). "Clear and Present Danger". The Washington Post. Retrieved January 27, 2014. ^ LaSalle, Mick (February 3, 1995). "Ford Vs. the Cynics in 'Danger'". San Francisco Chronicle. Retrieved January 27, 2014. ^ Berardinelli, James. "Clear and Present Danger". ReelViews. Retrieved January 27, 2014. ^ "Clear and Present Danger". boxofficemojo.com. Retrieved February 14, 2019. ^ "The 67th Academy Awards (1995) Nominees and Winners". oscars.org. Retrieved October 23, 2011.